A Recognition Celebration in the Diocese of Fort Worth, Texas was held in the fall of 2010 for our Bishop Kevin Vann and Father Richard Eldredge, Pastor of Good Shepherd Parish (Colleyville, Texas), the largest church in the diocese. Part of that recognition was centered around the "Our Priests" campaign...I attach some pictures of Bishop Vann and Father Richard at the celebration. 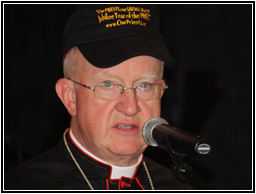 Note that both of them are wearing the "Our Priests" hat! We had such a great time with the hats and this campaign. We gave Bishop Vann and Fr. Richard a bag with the hat and shirt and the CD and DVD. 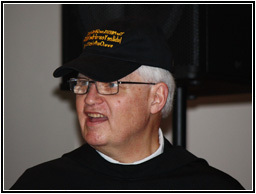 Providentially, we had one more "set" of "Our Priests" items, and there was also another Franciscan in attendance, Father Vince Elsen, OFM who is turning 89 this year and just now retiring to St. Louis. He too left with a gift bag with the hat and shirt and CD and DVD. Our priests are all so special. Thank you for all the good work you and the "Our Priests" campaign.... such a powerful and simple tool to use to encourage priests! God Bless.